Austria’s little known gem, Obertauern, is hardly an hour's drive from Salzburg Airport. It has an infectiously friendly laid-back atmosphere and with generally quieter slopes than the big name resorts it’s no surprise that this destination is gaining in popularity fast. Situated in the Salzburgerland region of the Austrian Alps and nestled within the scenic peaks of the Tauern mountain range, Obertauern was originally just a mountain pass before it became a ski resort. At 1750m it is one of Austria's highest ski resorts and one of the most snow-sure. The snow conditions are second to none. It has one of the longest winter seasons in the Alps, usually from November till May. 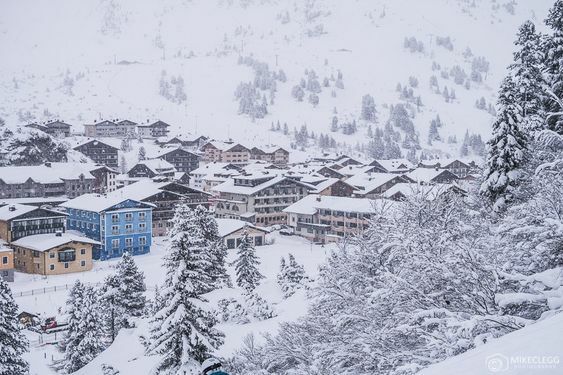 Obertauern is referred to as “Austria’s Snow Bowl” and having “Champagne Powder” due to the quality of the snow which has been scientifically proven to be some of the best and most reliable in Austria. Based on the 10-yr average snow depth Skiweather.eu rates Obertauern as one of the most snow sure ski resorts in the Alps. Obertauern is both Austria’s only attempt at a purpose-built destination and also one of its oldest. The village is a rarity in Austria. Don’t let that put you off, it has a charm of its own and bears no resemblance to the concrete purpose built monstrosities in the French Alps. The attractive, typically Austrian, chalet-style architecture is pleasing on the eye and gives the impression of a traditional Austrian mountain village. Of course the real advantage of a purpose-buil' village is that it brings real ski convenience. The majority of accommodations offer doorstep skiing so there is no need to catch a bus here. Skiing here has been well designed; the ski pass allows access to a modern interconnecting lift system where you can ski 100km of pistes in a natural circuit without the need of ski buses! This clever system allows you to always return to your original starting point, whichever direction you start off in. Obertauern's ski area is modest by 'super resort' standards and the vertical drop is not enormous, but the figures are deceptive and there is endless fun to be had exploring the various circuits you can make of the area in both directions. 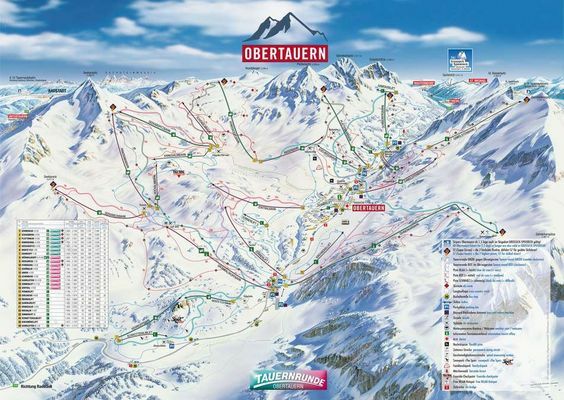 Obertauern's terrain is best suited to the all-round intermediate with the majority of the slopes being wide open blues and reds. Intermediates are spoilt with two thirds of the terrain graded at that level. You can clock up decent mileage on flattering, cruisy runs without encountering too many nasty surprises which makes Obertauern an ideal family destination. There are some wonderful wide nursery slopes near the village and in the centre of town with virtually guaranteed snow throughout the season. Strangely, for a snow-sure resort, most of the pistes are south-facing. The lift system is modern, fast and made up almost entirely of gondolas and high-speed chairs. Despite the resort being busy due to the excellent snow conditions, you will barely encounter a queue all week. The slopes are generally quiet especially outside peak weeks, perfect for beginners and families not wanting to waste valuable ski time in long lift queues. Obertauern also has some of the best piste maintenance. The mountain was alive late into the evening with an army of piste-bashers ensuring the slopes were in perfect condition for the following morning. The town has retained a slight village atmosphere with some fun and funky places to apres ski. There are plenty of bars and taverns and restaurants on the slopes to stop in for a break. There is fabulous apres-ski at "the Lurzer" and up the mountain at "the Hochalm". The Edelweiss bar on the slopes is a real treat at the end of your day - and a 400 meter run down an easy slope into the village after. 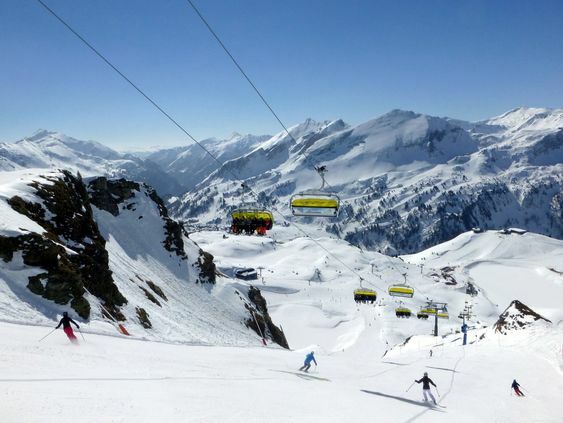 The resort is part of the Top Tauern Ski Check pass scheme which includes more than 30 ski resorts in the Tauern area, some of them lift-linked to one another, although not to Obertauern. Some of the better known resorts in the ski arena - which opens up over 700km of slopes and nearly 300 lifts - are Altenmarkt, Schladming and the Dachstein glacier lifts. By air: Salzburg's W.A.Mozart Airport is closest and offers shortest transfer times to Obertauern (1 hour 40 minutes). By train: buses leave every hour from the Radstadt station. The journey takes just 20 minutes by car.